This past Saturday was the Cape May See Life Paulagics trip, and our boat-full of eager birders were in for a great day on the ocean. We sailed out of the Cape May canal while the first hint of light rose above the horizon, passing 2 Harlequin Ducks, 7 Great Cormorants, 30 American Oystercatchers, and a nice spattering of the usual seaducks around the Cold Spring Inlet. The bird activity and beautiful sunrise had everyone up and out along the sides of the American Star, scanning the water for birds and chatting about what we might come across out there. 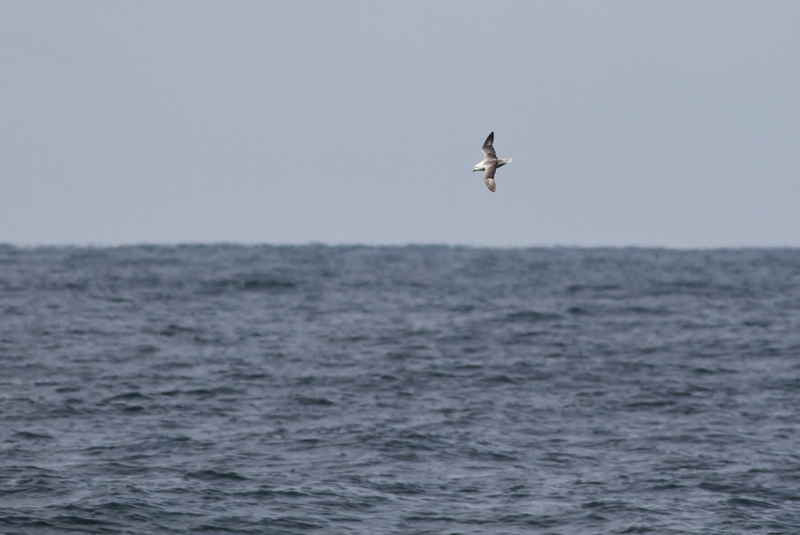 The ocean and the wind were calm which made for perfect seabird viewing conditions out on the water. As we moved further from the coast, Common and Red-throated Loons were floating in small groups while Herring and Great Black-backed Gulls began filing in behind our boat ready to grab up any bits of chum tossed out into our wake. About 10 miles out we started to come across our first Razorbills of the day, with small numbers floating on the water and scattered groups in flight. 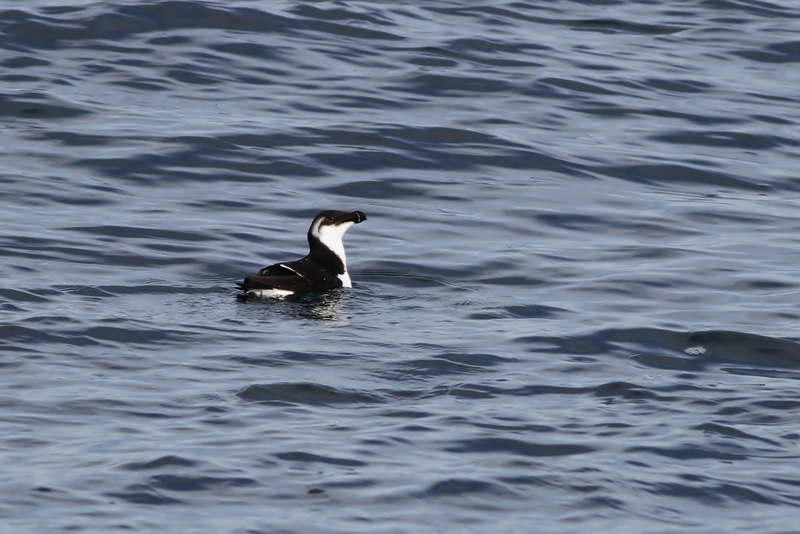 Razorbills are a staple of winter pelagics along the mid-Atlantic and are often fairly common offshore even in non-invasion years. Their long, narrow body shape and lanky wings set them apart from the smaller, chunkier alcids while their blunt, razor-like bill is unlike the thin, pointed bill of either murre species. In most lighting conditions they appear boldly black-and-white at a distance. 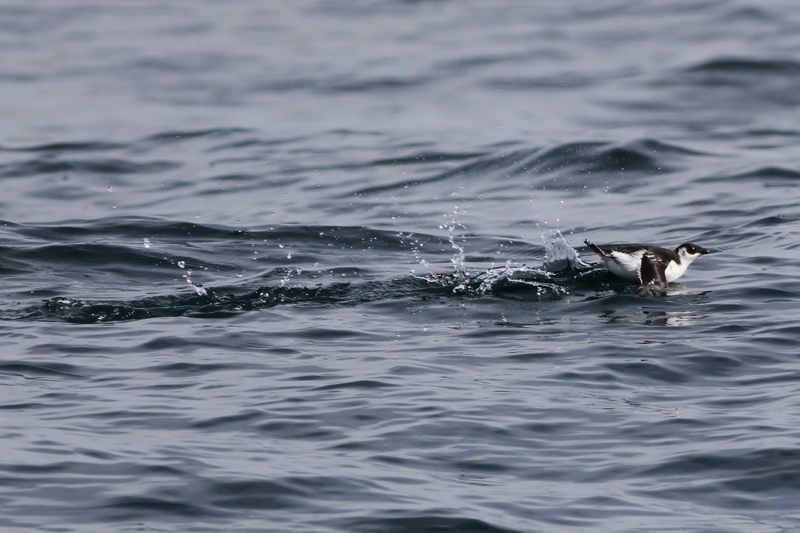 Razorbills are the most fearless alcid in this region, often letting the boat approach them and even diving in to our wake for chum alongside the gulls. Razorbills were less numerous on this trip than I’ve seen in the past, but we still had over 100 by the end of the day. 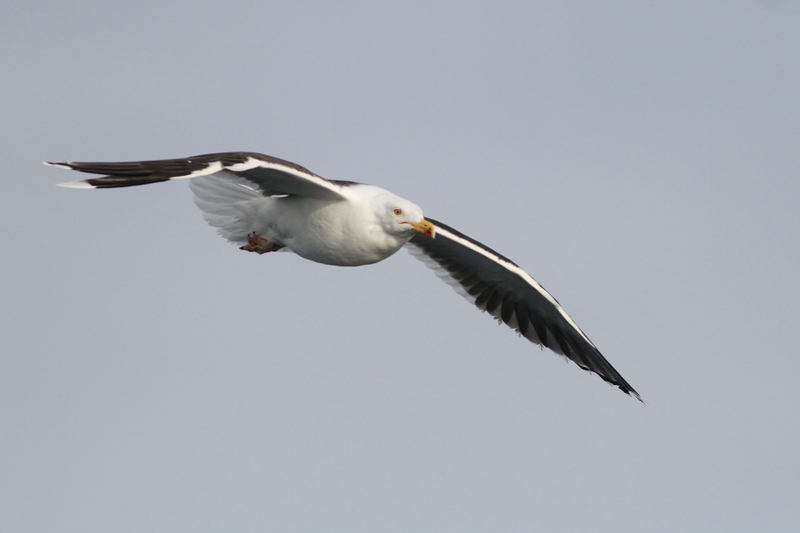 Around that time our chum slick was attracting a nice flock of gulls and gannets, which were trailing us around as the Captain drove further out to sea towards the north end of a huge undewater gorge known as the Wilmington Canyon. It wasn’t long before I heard Mike Lanzone’s voice over the radio saying he had a white-winged gull right behind the boat. Everyone rushed to the stern for a look, and sure enough an adult Kumlien’s Iceland/Thayer’s type gull was actively feeding among the larger gulls and gannets. The bird’s dark wingtips, bright pink legs, and darker eye color seemed pretty good for what would be a VERY rare Thayer’s Gull, but in the end we decided on a darker-type Kumlien’s Iceland Gull – a very handsome gull, regardless of species. 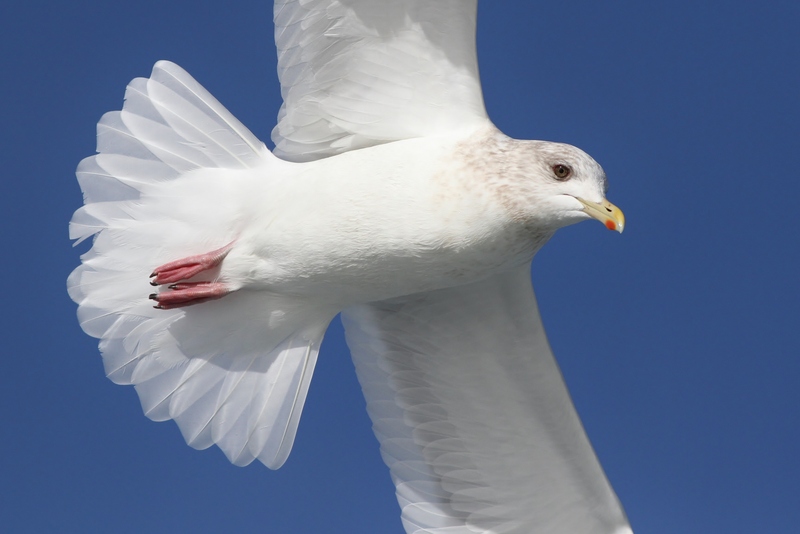 Iceland Gulls are uncommon along the New Jersey coastline during winter, and small numbers are known to spend considerable amounts of time far offshore. 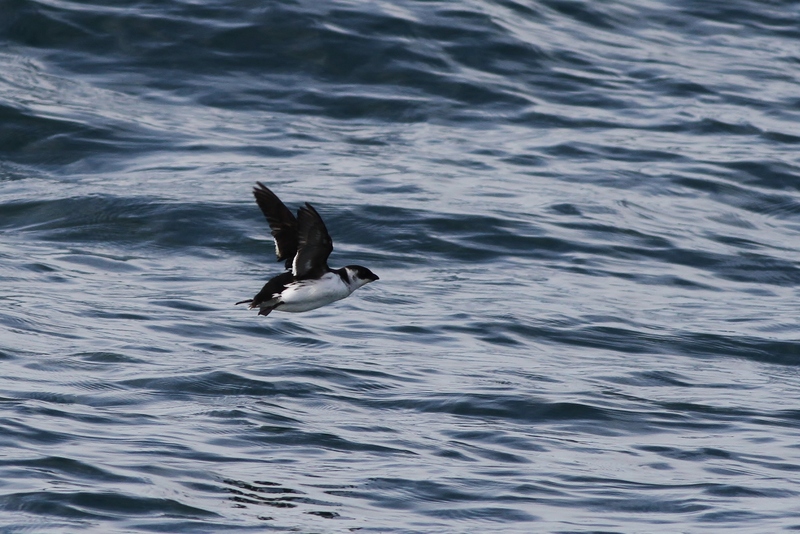 Razorbills are cool and everything but two rarely-seen alcids were the real target of this trip – the tiny Dovekie, and the charming Atlantic Puffin. 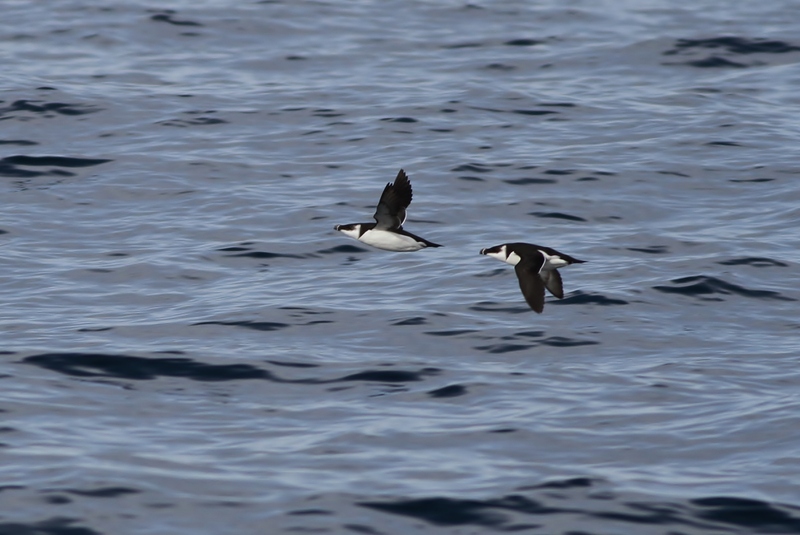 Both of these birds overwinter in the north Atlantic, and prefer deep water that is 45 degrees at the surface. We knew that all we had to do was get out that far, and we would be bound to encounter a few of each with some luck. 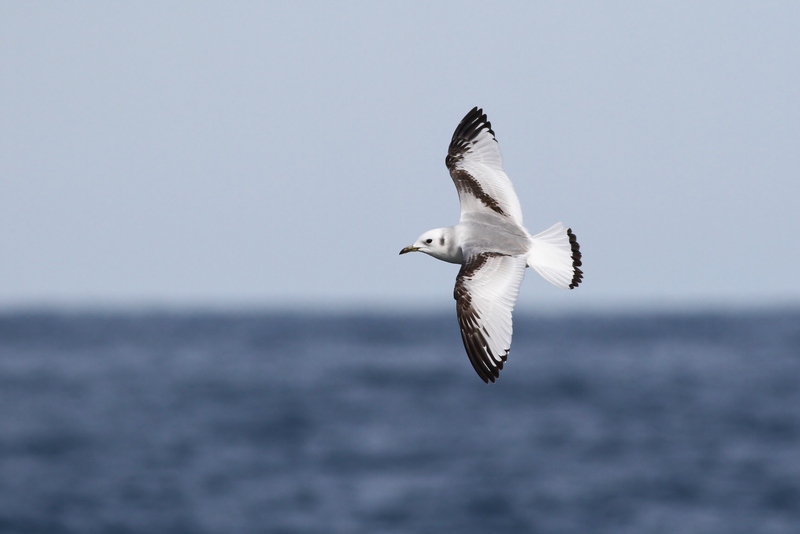 Around 11am, the Captain came on the speakers saying we had just crossed the 45 degree break and within minutes the first Dovekie were spotted in the distance; tiny, dark shapes with rapid wingbeats streaming by just above the surface of the water. To give you an idea for the size of these ‘Little Auks’, trip leader Paul Guris mentioned that Dovekie were the size of a European Starling. Their small, round bodies appear mostly black at a distance or when they are floating on the water. They also typically extend their neck when approached, giving them a taller profile than other alcids, and with a short and stubby bill. By the end of the day we saw close to 200 Dovekie. Our third species of alcid for the day was Atlantic Puffin. 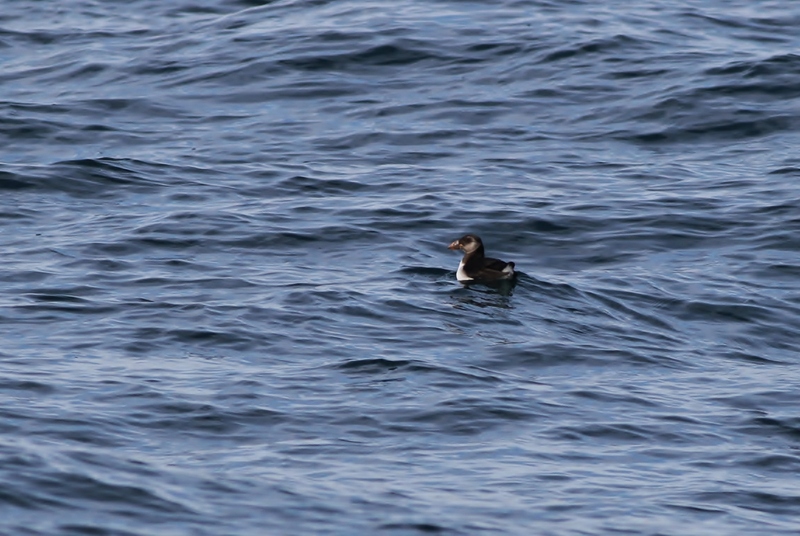 These birds are larger than a Dovekie but smaller than a Razorbill, and have a chunky profile further accented by their large, reddish-yellow bill. Although we saw them often on this trip, our day total was only 21 – much lower than our Razorbill and Dovekie totals, but still a very good count for New Jersey. Singles and pairs offered us fairly close views in binoculars, before they would inevitably swim further away from the boat, and we’d head off in search of something else. 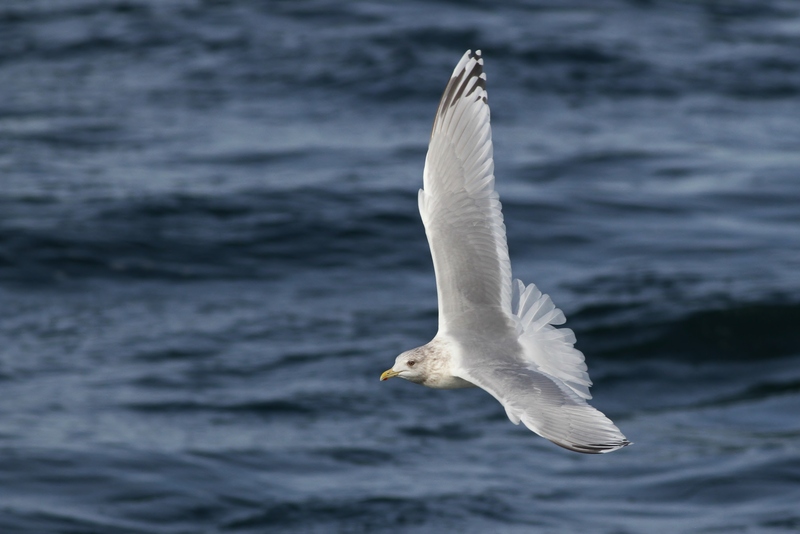 During all this alcid madness, we also had a constant show of mostly first-winter Black-legged Kittiwakes feeding behind the boat. The combination of multiple kittiwakes at close range, and the incredible lighting conditions provided one of the best photography opportunities I’ve ever had for this species! 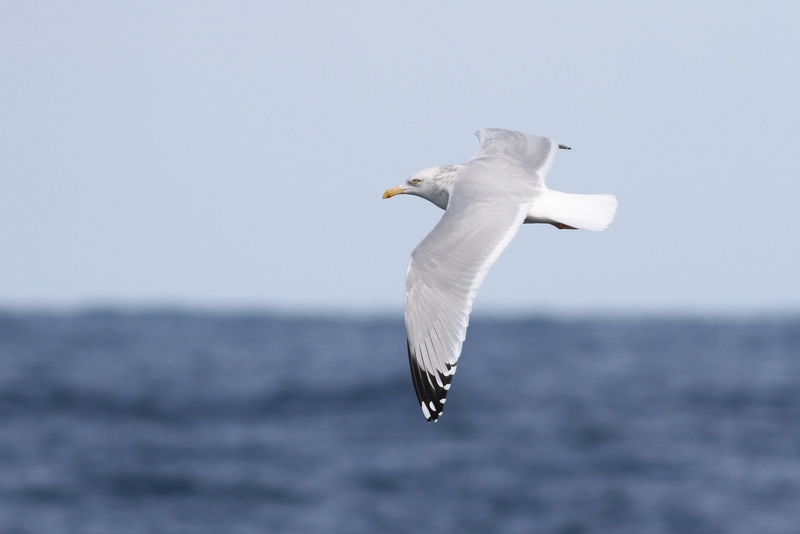 Although a common and fairly expected winter pelagic species, it was nice to be able to study and document these striking gulls at close range. Their flying skill and agility were put to the test as they would swoop in and grab bits of chum among the much larger gulls and gannets. 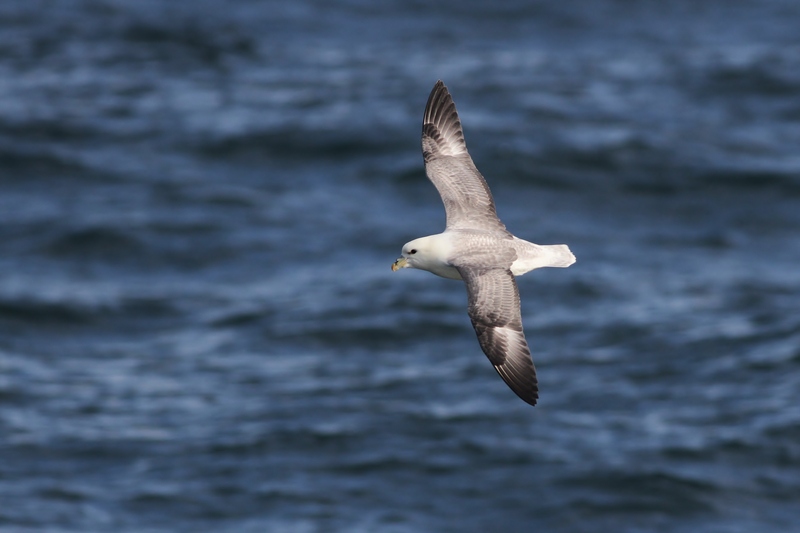 Along with kittiwakes, another fairly expected species out on the ocean during winter is the Northern Fulmar. We were lucky to see at least 15 of these chunky tubenoses during the course of the day. 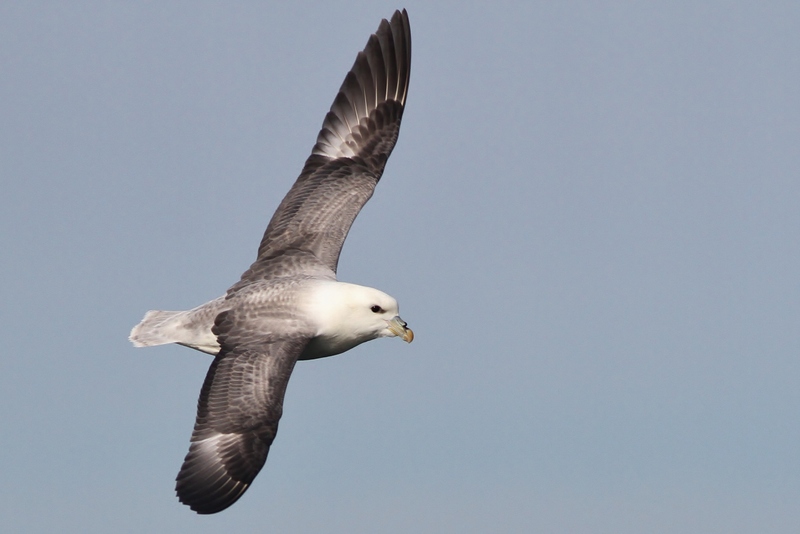 Fulmars are hardy seabirds that come in three color types, and we saw all light birds except for one dark. Check out the slo-mo flight video I filmed during the trip to get a sense of how quick and graceful their flight style is. Hopefully watching that video didn’t give you motion sickness – I recorded it with my Canon 7D from the moving boat. 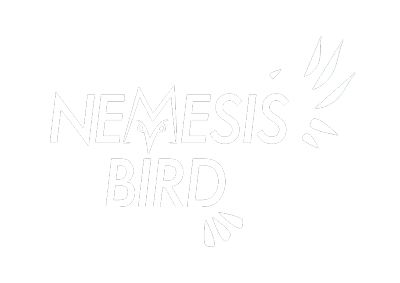 The video is slowed down by 50% to give you a better look at the fulmar, as well as show its flight style more clearly. The trip was going along pretty much perfectly by the afternoon, with all target birds found plus a few harder species that could have been hit or miss – but none of us were prepared for our biggest find of the day. During a brief period when the gull action behind the American Star had died down a bit, a large dark jaeger-type bird made a few passes across our chum slick way out behind us and then headed away. The Captain quickly turned the boat around and we were heading right back up the slick in search of what we figured must be a dark Pomarine Jaeger. Minutes went by with no sign of the bird, and I had pretty much given up hope when I spotted a distant black speck heading straight back towards us…. “That thing is heading right back at us, 12 o’clock!!”. 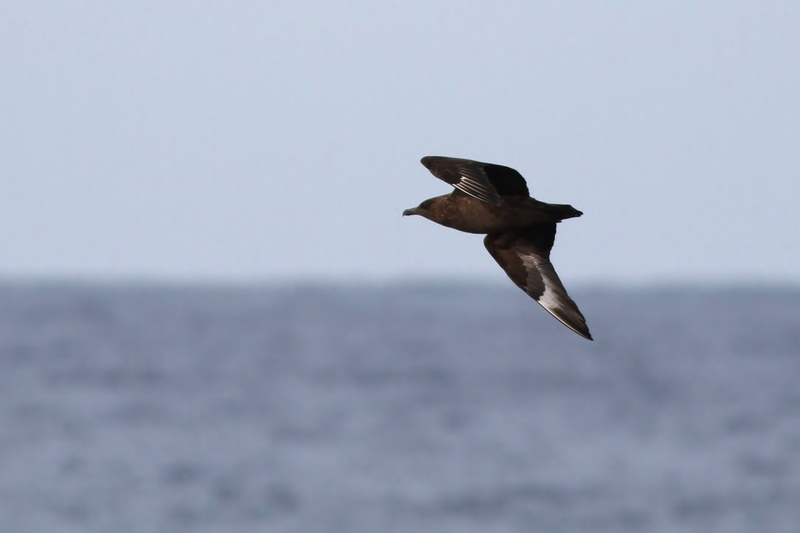 Everyone gathered around the edges of the boat to get a good view as it flew down our port side giving us a stunning broadside view of the holy grail of winter pelagics barreling towards our wake – a bulky, mean-looking Great Skua! I was dumbfounded and had to look down at my camera LCD screen to confirm what had just happened, meanwhile yells from the back of the boat meant the bird must still be in sight. 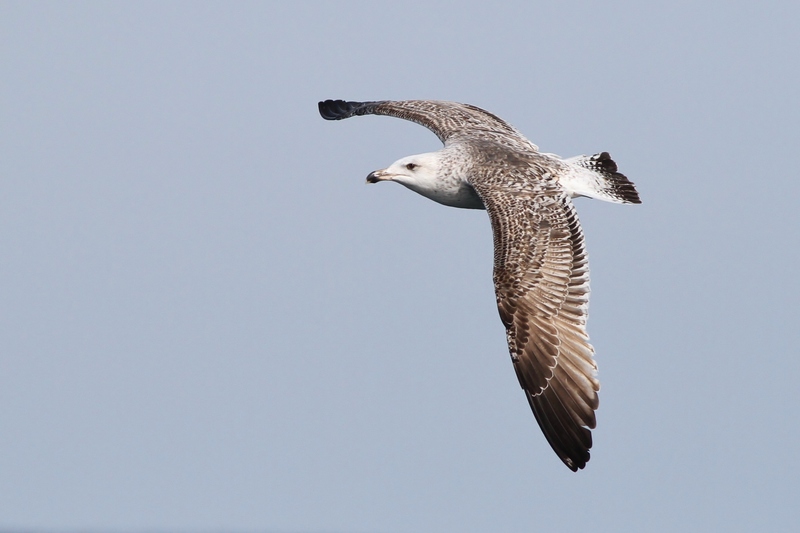 Sure enough the skua made a few more passes behind us, keying in on and attacking multiple Great Black-backed Gulls! 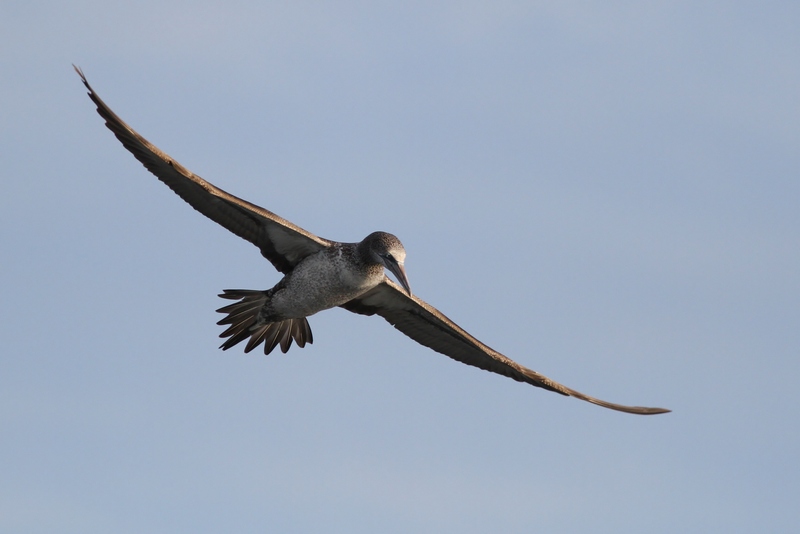 Great Skuas breed in northern Europe, and then wander out to the open ocean of the north Atlantic for the winter months. This species is very rarely recorded in this region, and this was the first seen in New Jersey waters since 2000. 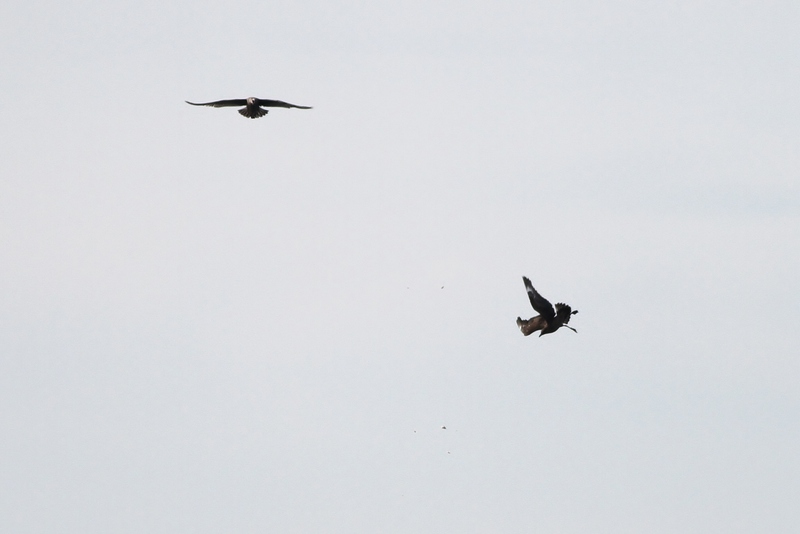 We also happened to be straddling the state line at that time and were happy to record the skua in Delaware as well – making it the 2nd state record. 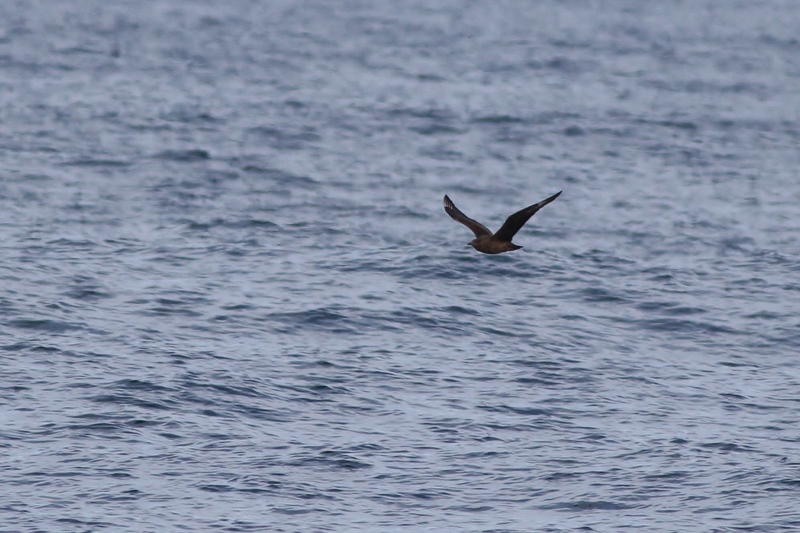 The skua was a lifer for many on board, including me! After the skua excitement, we starting motoring back towards Cape May. 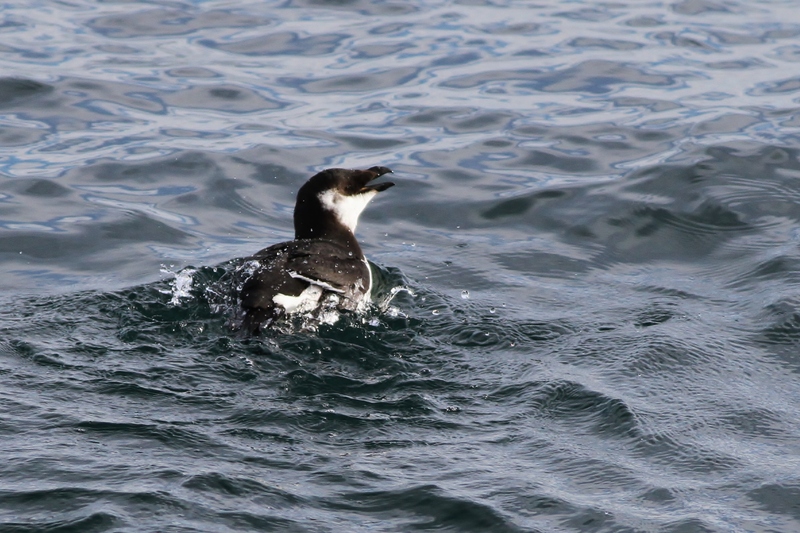 There was one glaring miss on our day list, and a few birders on board were getting a little restless about it – Common Murre. Careful scanning as we cruised westward snagged us one and it happened to be a really interesting individual. 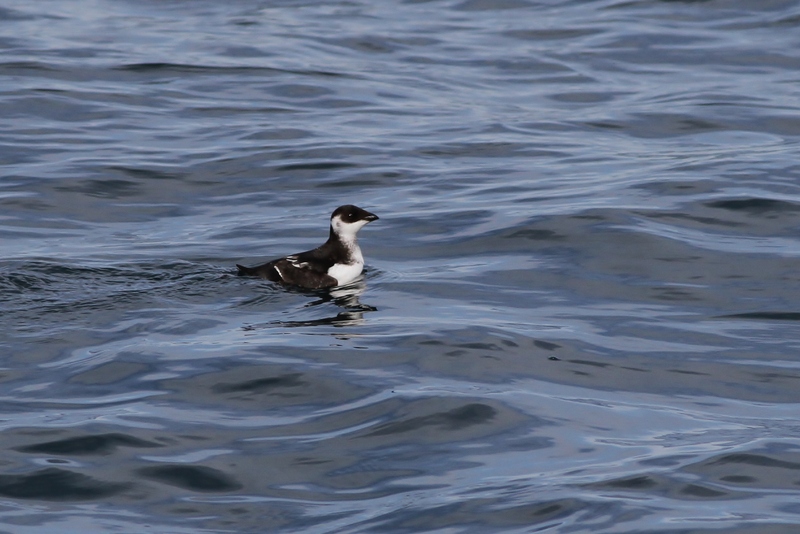 The boat slowed down and we attempted to approach the foraging murre. The bird’s overall darker plumage and was seemed to be a shorter bill than normal combined to make the murre superficially resemble a Thick-billed. This provided a great learning opportunity for many on board to study the reason why it wasn’t a Thick-billed: thinner bill, extensive grayish mottling on the cheek, and faint grayish streaking along its flanks. True Thick-bills are more distinctly black-and-white, without the grayish wash on their cheek and always show clean white flanks. They of course also have stubbier, thick bills, which show a white line at the gape. 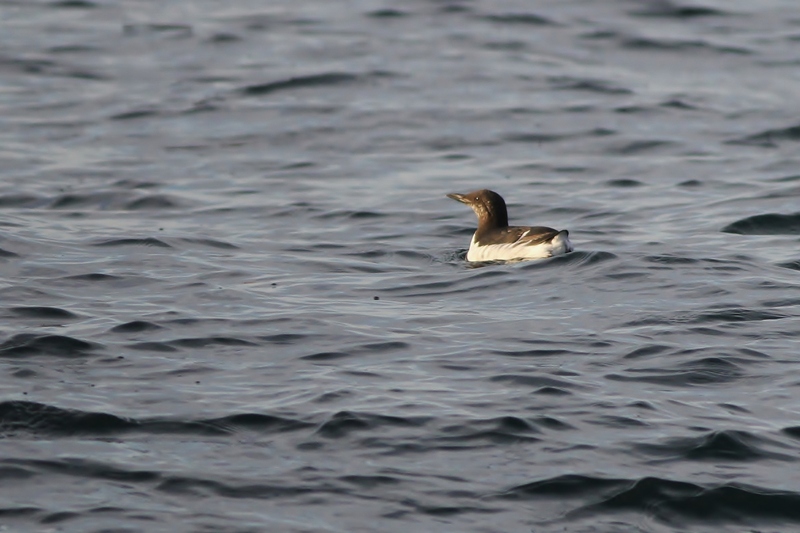 Common Murre are typically more abundant offshore this time of the year, and I was shocked we only managed to turn up the one bird so luckily we were able to get really nice views of it. I’ve mentioned it a few times so far, so I thought I would give them some more credit – the gulls and gannets trailing the boat all day made for something to look through when the alcids and fulmars weren’t showing off for us, allowed for some great opportunities to study the various gull plumages, and also kept the photographers busy filling up their SD cards. 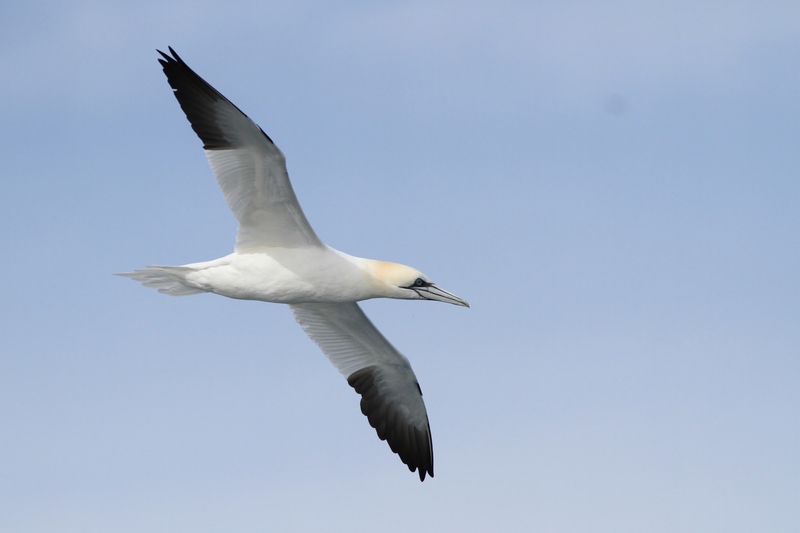 I heard multiple people say that the nearly constant gannet show behind the boat was worth the trip in itself!